I’ve been sort of quiet on the thrifting front this summer. As with all lovers of thrifty finds, my house was getting overrun with STUFF. I joke about it being a hoarding situation, but it’s more of a I really shouldn’t buy anything else until I find a place to display my last set of finds situation. I can’t keep piling it up on my dining room table, now can I? I blame it on blogging really. It seems before I started this whole blogging journey, I kept the incoming coolness matching the outgoing not-so-coolness. Something comes into the house, something goes out of the house. Peace and order is achieved and all is well. I’m not quite so good at that concept anymore, so I have tried to keep my purchases to a minimum this summer. Except for a few items I just COULD NOT RESIST. Hoo knew I had a thing for owls? 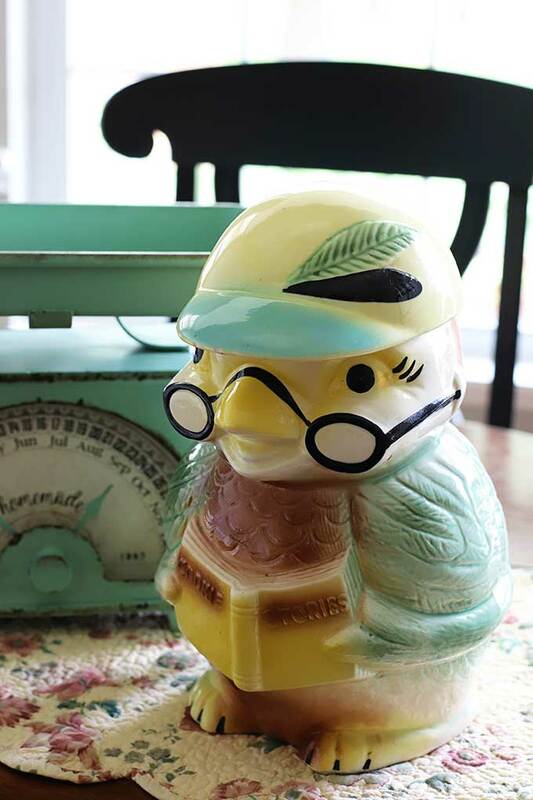 I found this vintage Robinson-Ransbottom owl cookie jar at a yard sale for a couple bucks and snatched him up. Pretty sure he’s a boy since he has a baseball cap on (sexist, much?). Robinson-Ransbottom (their pottery has RRP Co. Roseville Ohio imprinted on the bottom) was made not too far from here in Roseville, Ohio, so I find a lot of it at garage sales and church rummage sales in the area. He looks sort of funky and eclectic setting on my kitchen table. And pretty much useless, since there are no cookies in him because of this whole stupid dieting thing. And I bought both of these cameras for under $2. Total. The Brownie Hawkeye was $1 and the Spartus Rocket was 75 cents. For that price, I just couldn’t leave them behind! I found this milk glass hands dish at a church sale for a buck I think. I’ve seen these many times and never knew Avon made them until I turned it over to look for a makers mark. If I can trust Google, I believe these were originally made in the late 1800’s by a British manufacturer to hold calling cards (thus why my business card is setting in mine), but Avon “borrowed” their idea when they mass-produced these in 1969 and called it a Touch Of Beauty Soap Dish. It’s a little too small for a full bar of soap, so it must have been for those fancy little round soaps your mom bought and put by the sink but you were never allowed to use and then they just collected dust and you eventually threw them away because they were gross. I also bought this wooden crate thingie at the church sale. I have no idea in the world what it is, but when do you ever find a cool old heavy duty crate for a few dollars? You’re probably thinking, “girlfriend, that’s something you did not HAVE to buy”. 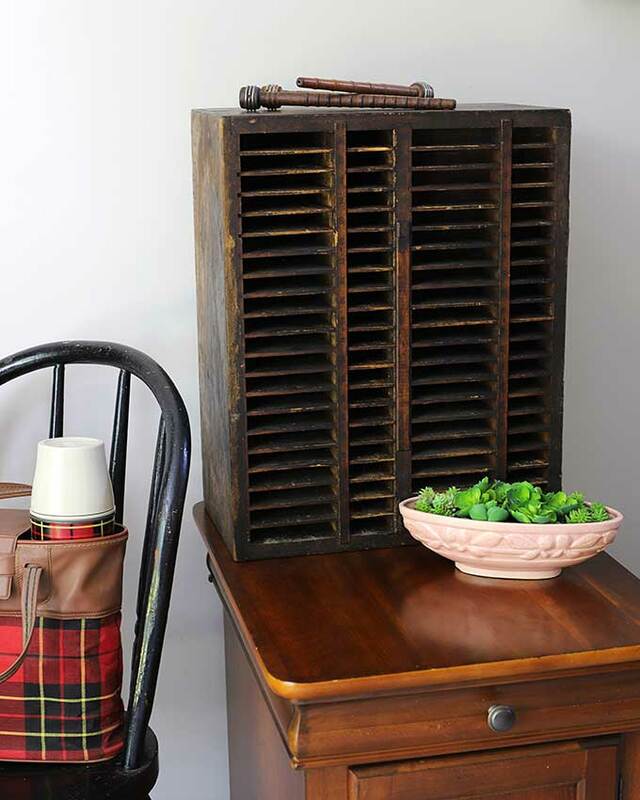 But it has such a great vintage industrial farmhouse vibe and looks so good in my living room! Of course, I had to buy it! It’s BIG too. Probably about 2 foot tall. I think the consensus on facebook was it was a cabinet to hold letterpress stuff. If you have any better guesses let me know! OK, besides owls, I have a thing for cardinals. In the spring we always have little baby cardinals running around the yard. I think we’re their personal baby hospital. 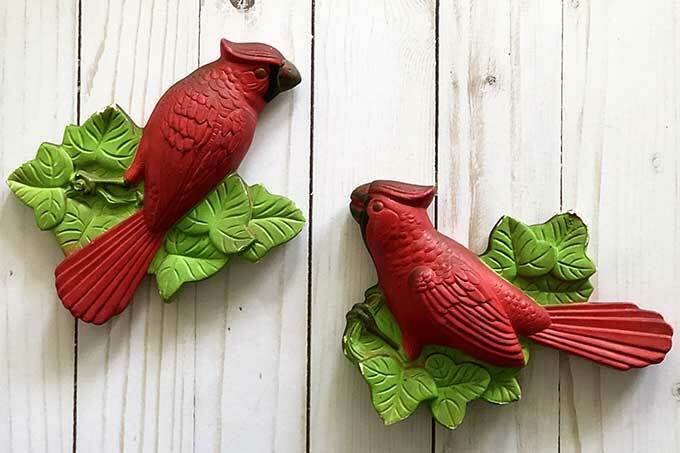 So of course I had to buy these vintage Miller Studios chalkware cardinals when I saw them from an Instagram seller. That’s right, I said Instagram. Did you know people sell stuff through our beloved Instagram, the purveyor of perfectly staged homes with perfectly karate chopped pillows and perfectly dust free coffee tables? Gina at Vintage Junk In My Trunk has the coolest eye for odd vintage items. She has an Etsy shop also, but I tend to follow her on Instagram because buying on Instagram is so much fun. 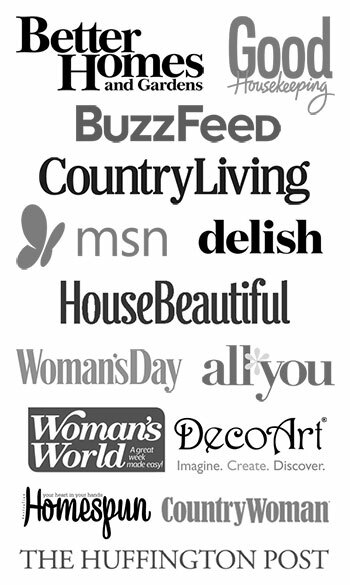 The way it works is she’ll announce that she’s having a sale at let’s say 7:00pm tonight. Then you set your timer on your phone to go off a few minutes before that time comes so you can run over to her Instagram page and wait anxiously for her to post a few items. There’s no bidding, it’s just the first person who claims it gets it, so it pays to sit there and keep refreshing your screen until the item you’ve been dreaming about all day pops up for sale! I don’t think Gina invented selling on IG, other sellers do it that way too. But Gina is the only one I’ve bought from so far. IG buying is seriously addictive though. Don’t blame me if you end up buying that whole box of horse show ribbons before you even know what to do with it (make a wreath!!!). And this is where my photography skills go down the drain. I couldn’t decide how to photograph these items so they looked more attractive, short of baking a pie for you. But the whole diet thing rears its ugly head again. 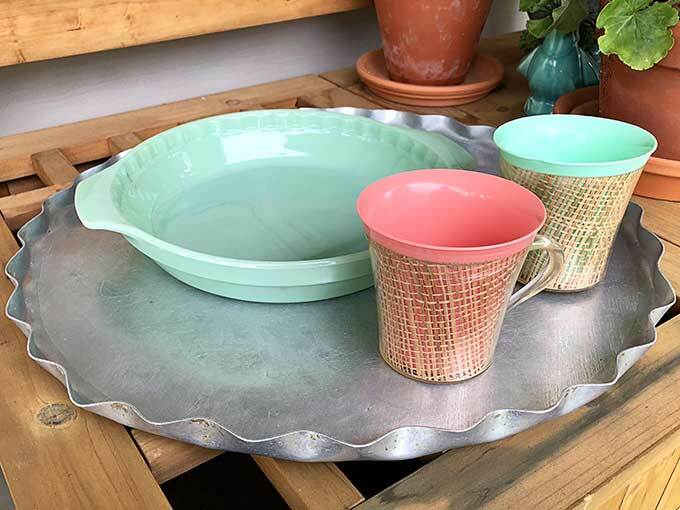 I bought a BIG hammered aluminum serving tray, a Fire-King jadeite colored pie pan and two vintage melmac coffee mugs. I do not need anymore non-used coffee mugs. But they reminded me of summers spent camping, so for a few dollars I get some happy memories percolating in my head. I couldn’t decide if the jadeite colored pie pan is really considered jadeite or not? Does anyone know if they are really collectible or if they are newer reproductions? I have seen them at antique malls before and they are not anywhere near the price of the other jadeite pieces. 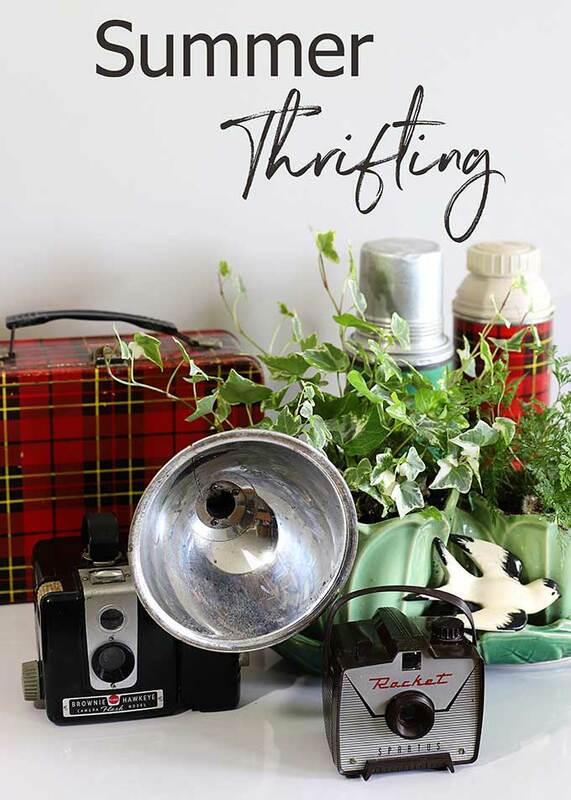 What have you found while out thrifting this summer? Your blog is fantastic. I think we should thrift together. When I read your stuff we are often at similar thought “places”, I’m just up in Minnesota, though! I’m at 90+ vintage thermoses and counting (my thrift addiction) , a big bunch of vintage coolers and cooler jugs, and a whole bunch of misc. …encountering your same problem… coming from that same place ( things were going out as they were coming in but now that is not happening as often) and running out of room. 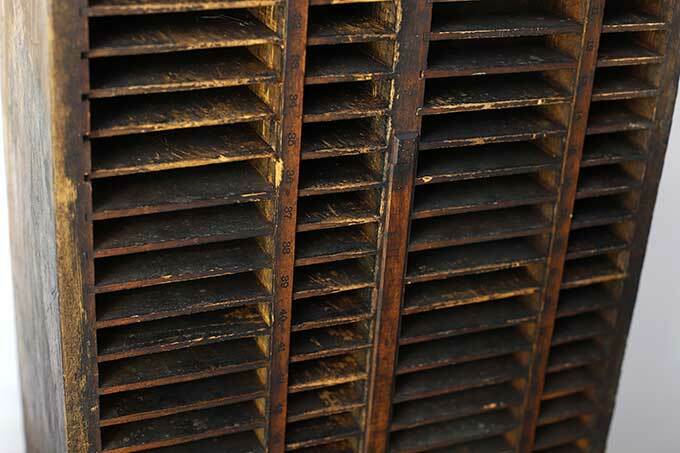 Your letterpress box is a “hot” item up here and goes for $$. Thanks for tip on Instagram but I’m not sure I should follow-up…ha ha. I love collecting cameras too but they are never that inexpensive here. Wish they were! I love your new finds – especially the Cardinals. I love Cardinals too – it started many, many years ago when we watched them outside my parents’ kitchen window. My daddy made a bird feeder that was maybe a foot below the bottom of the window and just a few feet away so we could see them close up. Now, I feed them in my own yard and watch them out of my own kitchen window. Of course, I buy them when I see them. I love the owl too – I collect birds bu don’t have any owls. I don’t buy many birds because I don’t want my shelves any more cluttered. I think your other purchases are great too! I have never actually fed the cardinals here. I think they like the Hawthorn trees along the edges of our property. Maybe I’ll try a bird feeder for them to get them closer to the porch! “Perfectly karate chopped pillows”….I’ll laugh about that all week. The best! ? Girl, I’m right on your wavelength…can’t buy any more till I have an estate sale to get rid of 50 yrs of junk, so I don’t go to any thrifts or yard sales right now. However, I can admire your finds! 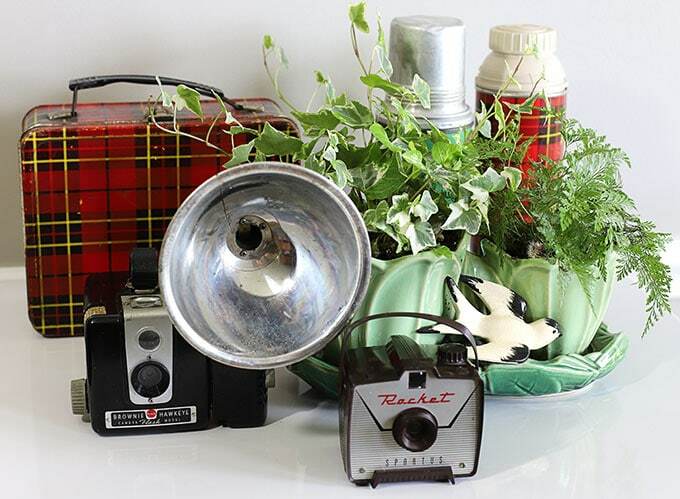 Love the owl planter, the cameras, & the retro coffee mugs! Are you still selling on Etsy? Yes mam, but I still have plenty of Stu on hand. As usual, you get the best stuff! And since we have the same taste, it’s a good thing I’m in a different part of Ohio!! And by the way, that letterpress box IS a must have! As for the faux Jadeite, I have some too. Because , seriously, I can’t do $150 for salt and pepper shakers! But it gives off the same vibe. Love your stuff! And now I’m going to have to check out the whole Instagram thing, so I’m sure my husband will thank you!! Don’t tell my husband, but I have a secret Paypal account that I keep just for that type of thing! You put my thrifting to shame – that owl. I die. Yesterday I found a nearly new and a vintage tie, both for a buck. I bought two new novels to read – again, a buck each. A new handtowel, and a new fridge storage bin, also both a buck. It was cheap thrills. I wish I had more time to peruse my favorite thrift stores, but I pop in whenever I can and try to make it count! Well, you just basically have to buy anything that is a buck or less. It’s a thrifting rule I think! You know, I’m with you. I have hardly bought anything for myself this summer. Now, I’ve bought a lot for my biz, so my junking need has been satisfied. I’m already dreaming about my 127 trip — so much so, that I booked my campsites 2 weeks ago! Are going to venture over to the 127 this year? YES!!! I cannot wait. I’m not camping though, just doing day trips. I always look forward to your recaps of the trip! The pie plate is modern, but still jadite. Some were made by Anchor Hocking, others by Martha, & still others by that conglomerate known as skme-Chinese-factory! This one actually says Anchor-Hocking and Fire-King on the bottom, so at least it’s American made 🙂 It also looks like it’s never been baked in and you know someone would have made a pie or a few hundred pies in it if it was really 80 years old! 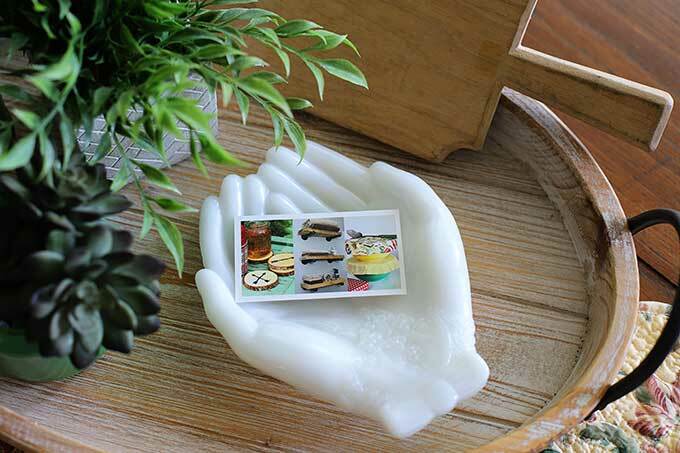 People used the jadeite back then, it was nothing “special”. I have seven of those coffee cups, all in different colors, and have never stopped wondering what the eighth color would have been. I’ve never seen an entire set or a color I don’t have so it DRIVES ME CRAZY! Oh, no! That would drive me crazy too! Watch, it’s probably black or red or something that totally does not go! 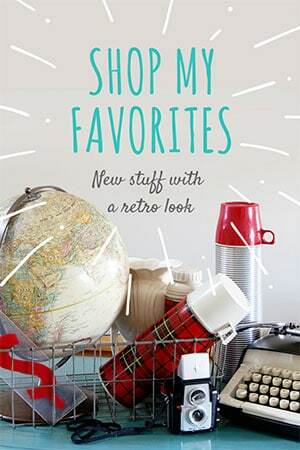 Love all of your finds, Pam! I’ve been cutting back, too, with the move…and am cleaning out. I’ve been thinking of starting an IG shop, too. I love shopping Gina’s stuff!